Wanting to make a banner celebrating God’s creation, with an African theme, suddenly our inspiration came! 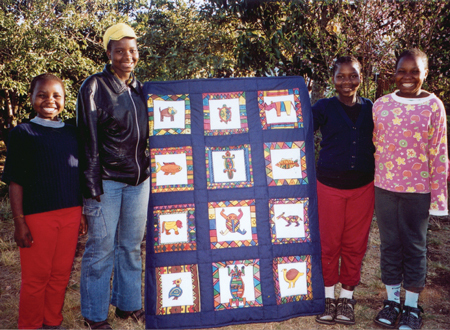 Gusta, who runs a sewing class, with my help, at an Aids 0rphanage and Community Care Centre, decided we would make a small quilt of squares with African images, using fabric paints. Gusta copied designs from a sheet of wrapping paper onto material and the children each chose and painted one. Then they added colourful borders. Gusta edged the colours with a black permanent marker. It was all pieced together with navy fabric and looked stunning when at a charity auction it raised R3000 (approx £220). This was spent on sewing machines and other new materials for our class.